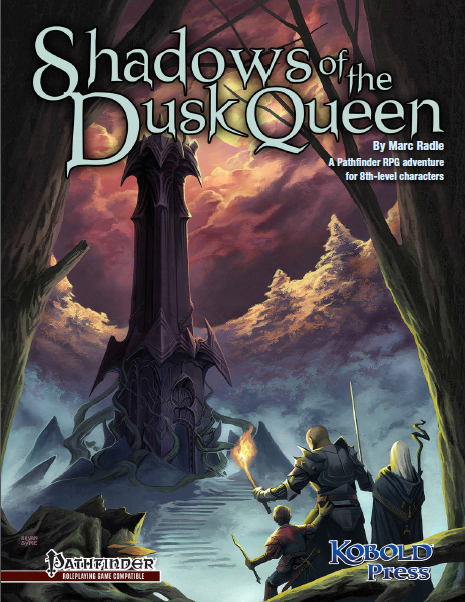 Shadows of the Dusk Queen is a Pathfinder Roleplaying Game compatible adventure for 8th-level characters that takes players deep into a forest out of a dark fairy tale, where a long-imprisoned fey queen has returned – and evil creatures are stirring. 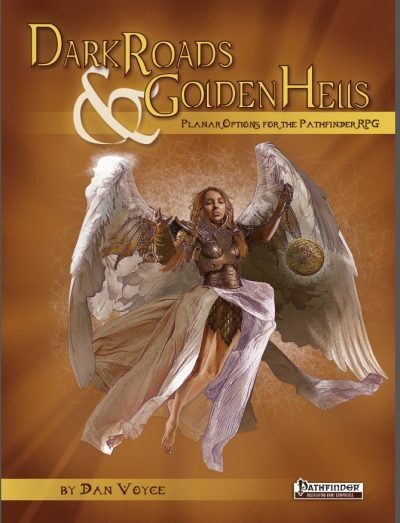 Featuring full-color art by Brian Syme, Shadows of the Dusk Queen is great for groups who love dark fantasy adventure, or for GMs looking to shake things up by bringing a little fear to the table. The whispers are getting louder. Do you dare take the forest path, and learn the secrets of the Dusk Queen? Includes 12-page art and map appendix to speed play; heavily illustrated. A mysterious forest, legends about an evil soceress who vanished completely but might now be coming back… is this enough to get your party to go and investigate? If not, perhaps they just happen to be travelling through the forest or have been hired to check the place out – a few hooks such as these are provided but in essence the adventure begins when the party enters the forest, no matter how they got there. Just where the forest might be located is left to you as well – it may even not be in Midgard if you are not using that setting. A brief Adventure Background lets you know a little about what is going on, and then we’re off, beginning with an encounter with a treant with obscure motives, but who could be quite helpful if handled the right way. If the party are there by chance, however, this encounter might prove rather baffling as the treant assumes they know what’s going on! Fortunately, if the characters are too puzzled, other forest denizens have been provided who have a good understanding of the situation and are prepared to help out – indeed it’s suggested that you use them to keep the plot flowing if it stalls due to the party being unsure about what they ought to be doing. This is a location-based quest adventure. Each location is described and the events or encounteres associated with them given in detail, along with applicable monster stats. Interestingly, many enounters are with creatures subtly modified from ‘book standard’ to suit the shadow fey feel, stirges that can hide in shadow and the like. There are some nice illustrations embedded in the text and, in a neat move, they are provided in an ‘Art and Maps’ appendix if you like to show your players what their characters see. This is a well-presented scenario, a little forced in the assumptions made about what the characters will do perhaps, but enjoyable nevertheless – and if the threat posed is presented well and the eerie menace of the setting played up, successful characters should have a feeling of real accomplishment, of having prevented a genuine menance developing in the area. This module clocks in at 36 pages, 1 page front cover, 2 pages of editorial, 1 page SRD, 1 page back cover, leaving us with 31 pages of content, so let’s take a look, shall we? This module was moved up on my review-queue at the request of my players. The following being an adventure-review, from here on out, the SPOILERS reign. Potential players should jump to the conclusion. All right, still here? Even the shadow fey can love, in their own, alien way – and so, a scáthesidhe, exiled from the winter court and hence known as the dusk queen, retreated to the dark woods and ruled as one would expect from a lady with her moniker. Against all possibility, a man from a far off land of eternal sun and scorching heat found his path into the dusk queen’s dominion, where the two promptly fell in love – and here, the story might have ended, were it not for the construction of a dark mirror, which fueled the latent paranoia of the queen. The traveler, then known as sun king, tried to overlook his lover’s continuing descent into amorality and evil, but when he noticed her plans to invade his home, he acted – weaving mighty magics, he imprisoned the queen and sundered her mirror; tales of tragic love being what they are, his solution did not prove to be permanent – and thus, the PCs happen upon a foreboding, dark forest, where the wind itself carries the words “She has returned” to their ears. 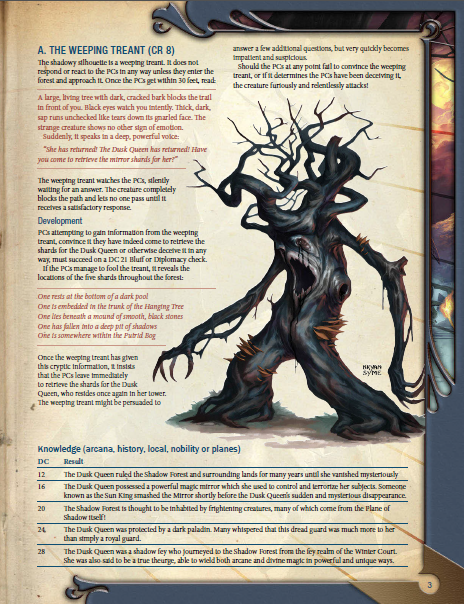 Entering the forest, a lavishly-illustrated treant weeping acid tears tasks the PCs in cryptic hints to track down the shards of the dusk queen’s mirror – and escape is no option. From hampered teleportation to swarms of shadow stirges, the forest does its best to foil the PCs and yes, there is a table of wandering monsters, of which I encourage you to make ample use. The shadow forest’s overview map (which is no less beautiful than the artwork) does provide several obvious paths that can be tackled in different sequences. The locations themselves can be considered a veritable who’s who of dark forest locations – from a pool of shadow nymphs to a bog most foul hiding an ancient monument and a spirit naga to a strike-force of bugbears under the command of a half umbral-dragon leader to a massive hangman’s tree, the task of collecting the shards is a quick and interesting succession of iconic locales – and yes, of course, the PCs also get a chance to duke it out with a shadow drake. 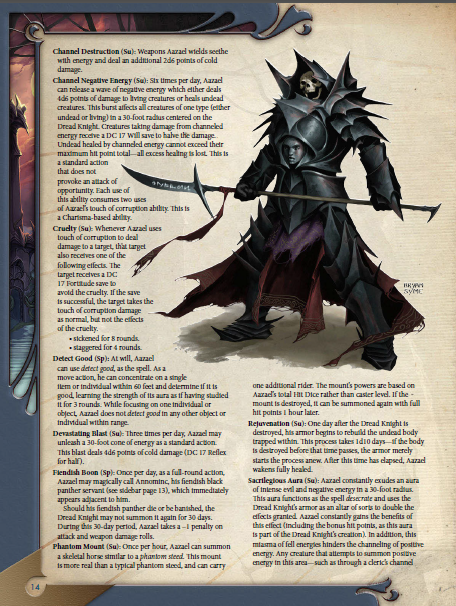 Once they have finally assembled all the shards, it’s time to face the dusk queen’s tower, wherein she tries to cajole them into using the shards to repair her mirror and restore her to full power – hopefully barring that, she will attempt to use force – by means of her own theurge-magics as well as a graveknight antipaladin and his companion. Besting the two deadly adversaries (significantly easier if a strong-willed PC uses the powerful shards to blast them!) will see the end of the adventure and the tower’s collapse – for now, for a sequel is in the making. Oh, and yes, there is a powerful, intelligent spellbook to be found here. 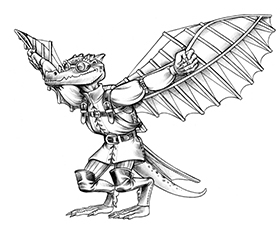 Now this pdf has GLORIOUS artworks and cartography all around – and you can actually use both: The module provides an art & map section that reproduces the Paizo-level gorgeous artwork (one provided for most major antagonists!) as one-page hand-outs to show to your players. Furthermore, the glorious full-color cartography of the dark wood is provided in a player-friendly version and to trump that, we also get the dusk queen’s ruined throne room as a player-friendly, overview with a grid AND in battle-map-style size to print out – now THIS is going one step beyond! Two thumbs up! Editing and formatting are top-notch, I did not notice any significant glitches. Layout adheres to a beautiful, 2-column full-color standard and the artworks by Bryan Syme are staggering -see the cover? The copious amount of interior artwork is JUST AS GOOD. Yes. This is one of the most beautiful modules I’ve read in ages, with cartography also ranking in the top-tier echelon, especially due to the copious support regarding battle-map, player-friendly versions etc. The pdf comes fully bookmarked for your convenience. My players still talk fondly of Marc Radle’s first module published by Raging Swan Press, The Sunken Pyramid, so when I brought this module to the table, they were keen on playing it. The dark wood has a superb atmosphere that thankfully stands on its own and does not provide overlap with AAW Games’ superb Snow White duology (Part I and Part II), instead creating its very own atmosphere and mood – which is a good thing. This module is all about atmosphere that is captured in great detail and enhanced by what could be considered to be some of the most stunning pieces of artwork I have ever seen in a 3pp module. Especially at the low price point, this is stunning. Now I playtested this one twice, for a reason – my players were insanely lucky and had 14 natural 20s in the run of this module – and since it is pretty much a brief one that focuses on atmosphere, this meant they pretty much curb-stomped the opposition. When I ran it for a second time for a significantly less experienced and optimized group, there was one unlucky PC death, though that is to be attributed to abysmal luck. This module is not a meat-grinder and neither is it particularly challenging – the final fight in particular was very easy on my PCs in the first run.